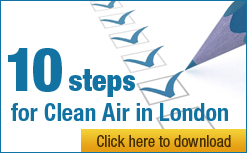 Clean Air in London (CAL) welcomes the opportunity offered by the European Commission (the Commission) to respond to the public consultation on European Union (EU) air quality legislation. CAL notes the deadline for online responses to the questionnaire is 15 October and 30 September for other responses. Key elements of this response and perhaps further points, in particular relating to the detailed questions in the questionnaire, will also be submitted online by 15 October. Thank you for aligning the deadline for public responses with that for other respondents. CAL is a not for profit organisation with a mission that includes campaigning to achieve urgently and sustainably at least World Health Organisation Standards (WHO) guidelines for air quality throughout London. Further details about CAL including its supporters and Gold Sponsor, Camfil Farr, can be seen on its website at: http://cleanair.london/. The UK and London in particular have some of the worst air pollution in Europe. The World Health Organisation (WHO) this week estimated more deaths in the UK were attributable to long-term exposure to particles in 2008 than any other country in the EU 27. The UK has a higher percentage of zones exceeding the NO2 annual limit value plus margin of tolerance than any other country in the EU 27 (i.e. 40/43). The Government has admitted that 698,543 people in London near 1,481 km of roads in an area of 91 km2 were exposed to unlawful levels of NO2 in London in 2010. Nationally, the numbers are: 925,095 people; 3,634 km; and 242 km2. The Mayor of London and the Government have failed to respond adequately to this invisible public health crisis. In Plans and Programmes submitted to the Commission this week, the UK has admitted it does not expect to comply with NO2 limit values in 23 zones until 2015, 16 until 2020 and in London until 2025. This is totally unacceptable. CAL urges the Commission to send a first written warning on NO2 to the UK by December 2011 and a second and final written warning before the London 2012 Olympics. Infraction action on PM10 should be pursued immediately if any limit values are breached. PM2.5 baselines, monitoring and plans should be assessed rigorously. The ‘Year of Air’ must deliver continuity and the further tightening of health and legal protections in 2013 and beyond. CAL notes that the current EU legal standards for PM10 are around twice WHO AQG like those for PM2.5 in 2020. In contrast, current EU legal standards for NO2 are aligned with WHO AQG. With air pollution near our busiest roads broadly in line with PM10 legal standards and twice those for NO2, it is clear that air pollution near such roads needs to be halved urgently. This is the real opportunity for the ‘Year of Air’. 2. the Commission must ensure for Member States that the baselines, monitoring and plans and programmes for PM2.5 are robust or it will be having an another ‘Year of Air’ in 2020 e.g. 2005 ‘becomes’ 2011 for PM10, 2010 ‘becomes’ 2015 for NO2; and 2015 ‘becomes’ 2020 for PM2.5. 5. by ensuring full compliance with existing ambient air quality laws and tightening them, Europe can show the world how to address wider air pollution and sustainability issues everywhere through a mixture of political will, technology and behavioural change. Please remember throughout your discussions with the UK that it is one of the least compliant countries and worst ‘free-riders’ in the whole of Europe when it comes to complying with air pollution legislation. 7. the Commission must ensure for Member States that the baselines, monitoring and plans and programmes for PM2.5 are robust or it will be having an another ‘Year of Air’ in 2020 e.g. 2005 ‘becomes’ 2011 for PM10, 2010 ‘becomes’ 2015 for NO2; and 2015 ‘becomes’ 2020 for PM2.5. 10. by ensuring full compliance with existing ambient air quality laws and tightening them, Europe can show the world how to address wider air pollution and sustainability issues everywhere through a mixture of political will, technology and behavioural change. The latest scientific evidence suggests that social and racial inequalities may be worse for NO2 than PM10 perhaps because NO2 concentrations are often strongly correlated with those of other toxic pollutants e.g. from traffic. The failure by the Mayor of London and the Government to respond adequately to this invisible public health crisis is a scandal. The UK submitted its plans and programmes for NO2 to the Commission on 23 September 2011. These showed that only three of 43 zones complied with the NO2 limit values by the deadline set in legislation in 1999 of 1 January 2010. The UK has admitted it does not expect to comply with NO2 limit values in 23 zones until 2015, 16 until 2020 and in London until 2025. The Government has given clear signals that it is lobbying to avoid infraction action and weaken existing air quality legislation. The masking of air pollution by official monitors and lack of action is totally unacceptable. i. Please repeat immediately for NO2 the action the Commission took against Member States on PM10 i.e. launch infraction action against the UK for 17 zones, including London, for which it admits it cannot demonstrate compliance with the NO2 limit values by the last possible deadline allowed under the EU Directive on ambient air and cleaner air for Europe (Air Quality Directive). CAL urges the Commission to issue a Letter of Formal Notice (ie first written warning) by 31 December 2011 with a Reasoned Opinion to follow two months later. Please move swiftly through the infraction process to seek a judgement by the Court of Justice of the European Union against the UK. ii. Please reject the UK’s application for a time extension to comply with the NO2 limit values in 23 zones for the reasons set out in the attached letter (NO2 TEN letter dated 4 August 2011) and then progress infraction action in respect of those zones too on the above basis. CAL hopes the UK Government will learn now from its serious failings to comply with limit values for NO2 including the current difficulties it faces in applying for a time extension – and propose and implement rapidly plans to comply fully with legal standards for PM2.5 by 2015. It is important not to consider the health impacts of NO2 narrowly as one molecule (as the Government seems to be doing). Please find attached the Racial Equality Impact Assessment done by Defra for its time extension consultation for PM10 (in August 2009). It shows non-white British exposed to 17% more PM10 than white- British and black–British exposed to 30% more PM10 than white-British. CAL is not aware of any social inequality work done for PM10 in 2009. Social and racial inequalities may be greater for NO2 than PM10 because NO2 is a marker for combustion related pollutants e.g. traffic. In CAL’s view, a one-pollutant legal framework would never be sufficient for controlling ambient air pollution e.g. one focused just on particulate matter. In closing, CAL would welcome the opportunity to participate in the Commission’s consideration for the ‘Year of Air’.